I began to slowly fill my pool as you directed today as it was 76 and bright sunshine, when the water got to about 9" deep the liner bead came off the pool frame and dropped into the pool. The liner is not damaged anywhere that I can see. Obviously I have to drain water and repair sand bottom. I took some measurements of my pool frame and it is 23' 11" at bottom and top. As I mentioned in my previous email to you, the liner fit real nice to the top of pool frame upon installation, but I questioned the 2-4" air gap at the bottom of the pool frame, which would explain the approx. 7" difference in the next sentence. I measured the liner after it came down today and it is approx. 23'4". Is this normal? Also from pool frame bead channel to sand is 48"-49", this is the original dimension from my old liner as I did not change this during prep and grading of sand. To my uneducated eye it seems the liner is to small for the pool or I need to add additional sand and slope the sides more? Is there a general measurement you use from pool edge out? Any help you can offer will be greatly appreciated. Thank You. Hi Bud. I would find the measurements you provided just fine here in Arizona when it's one hundred degrees plus in full sun. The stretching properties of vinyl change so much with every little increase in temperature. The seventies is still a little chilly to get much stretch out of a liner, even in direct sun. I assume from your measurements that you ordered a 24' liner. On a warm day, if you were to get in the pool on your hands and knees and push the liner towards the wall in all directions, you would probably get pretty close to 24' out of it. So much depends on the temperature. If it were me I would continue to work with the liner you have as opposed to returning it and taking your chances of getting one to big. You could try adding a little more cove if you think it would help. You could also try pushing the bottom towards the wall and seeing if there is any way to gain a few more inches that way. Use the sun and the soon to come warmer weather to your advantage and the liner will probably fit just fine. The only other suggestion is to make sure the bead is firmly in the receiver. Downward pressure on a liner should not pull a liner out of the receiver, is it possible it was not firmly set in that area? We installed a new 15 x 30 pool and now the beaded liner will not fit, it is too small. What do we do to make this fit? Hi Lori. I am going to assume this is a brand new liner going in to your new pool. I will also have to assume the liner is just a little to small as opposed to being completely the wrong size for your pool. Try installing the liner on the warmest day possible with direct overhead sunlight. Direct sun on the liner can make all the difference in the world. If the liner is to small, as in not enough around the top, and it is not fitting in the bead, the sun will help. You may need to make several tries at this, taking the liner completely out each time. As you are putting it in the groove, pull and stretch it as you go. This is where the direct overhead sun will make all the difference in the world. If you have the bead at the top in all the way around, but the liner is away from the walls, this is probably just fine. Again, use the sunlight as you begin to fill the pool. In direct sun it is amazing how much a liner will stretch. As you are adding water push all the wrinkles to the edge, keep working the bottom to get all the liner to the outside as possible. If the liner is still away from the wall, and you loose the sun, shut the hose off and try again the next day. Please use the comments option below if you need more information. My liner has come away from the beading and slipped down around 1/2". Is there any easy way to pull it back into position? Hi Peter. Yes, it can be put back into the groove. The question will be how much water will you need to let out of the pool before this can be done. Try working with it during the hottest part of the day, or the time of day when that area has the most direct sunlight. The sun works like magic to make a vinyl liner more pliable and workable. You may need to drain some water out of the pool. If so, take out only what is necessary. As the pool is draining keep trying to put the liner in place. At some point it will go back into the groove and you should start immediately refilling the pool. If the refilling is done in direct sunlight you have the best chance of the liner staying in place. The sun will allow the liner to stretch a little and it may not be so tight in that spot. About two weeks ago my beaded liner on my 24' x 52" pool pulled away from the wall and the water drained out the bottom on one side. The liner does not look damaged, it is still attached on the skimmer and return. I still have the pool covered. I installed a new liner last year and it pulled away twice in the beginning of the summer not enough to lose water, I pulled it up and reinstalled the bead in the channel. I think there was not enough sand on the side it pulled away from. 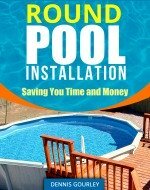 My question is can I replace the sand and reinstall the liner or will I need a new liner? What are the steps I will need to do? Hi Larry. A liner in its first year or so should be OK to drain and refill. The liner should still have plenty of elasticity. If it is at all possible I would try to leave a little water in the bottom of the pool. It is also a good idea to leave the skimmer and the return hooked up. Leaving water in the bottom and the skimmer attached keeps the liner from shifting. A helper could help to hold the liner back out of the way while you added sand and smoothed out the area. There are also pieces of plastic that can be forced into the bead receiver that tighten the fit for loose fitting liners that tend to pull out like yours is doing. These might be worth looking into.